The incredible story of Britannia under siege by a dark force, led by one man driven to unify Britannia and restore peace has been brought to life in a new audiobook by SciFi Publishing. A great story about a time before King Arthur. SciFi Publishing is proud to announce the release of its newest scifi audiobook, Dragon's Banner. 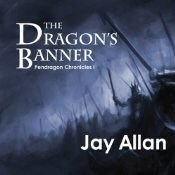 Dragon's Banner, written by bestselling author Jay Allan, is now available for sale on Amazon, Audible and Itunes..
Uther Pendragon is the son of a king and grandson of an emperor. He and his allies will journey to the heart of the dying empire, lead great armies, and forge a fragile alliance, the last hope to preserve the fading light of civilization. Amidst the ruins of Roman power and glory, the free peoples of Britannia make their last stand against the forces of darkness. On blood-soaked battlefields and before towered fortresses under siege, Uther and his warriors wage the final war for the future of Britannia. But will victory come at too high a cost? 5.0 out of 5 stars "Never Before Have I Read Such a Great Story!!!!!" 5.0 out of 5 stars "Excellent storytelling of Pre-Camelot Britain!" 5.0 out of 5 stars "Wonderful read"
Jay Allan currently lives in New York City, and has been reading science fiction and fantasy for just about as long as he's been reading. He enjoys military and dystopian science fiction and epic fantasy. You can join his mailing list at http://www.crimsonworlds.com for updates on new releases.